The Matrix has you…. as our 1,000,000th visitor!!! YOU HAVE WON A FREE* REVIEW! READ ON TO CLAIM YOUR PRIZE! Ahem… If you’ve ever wanted to fill the digital Doc Martens of a master hacker (free from those pesky legal consequences, of course), the newly-released Hacknet can drag you down that particular rabbit hole and show you just how deep it goes. Developed by Team Fractal Alligator (that is, the lone Australian-based dynamo Matt Trobbiani), Hacknet jacks you right into the thick of things as you’re contacted by Bit, a fellow hacker who implores you to help him. Oh, and did I mention that Bit is actually already dead? Curiouser and curiouser… What follows from that little narratory nugget is essentially the pulling of a seemingly inexhaustive number of threads – some loose, some fairly well-anchored – as you – the player, the one who’s reading these very words – are tasked with unravelling the shady strands of Bit’s seemingly untimely demise. Armed with nothing but your keyboard, keen wits and code-based computer commands, you enter the company of various hacker groups who give you a whole host of jobs to do at your leisure: stealing sensitive files, deleting incriminating comm. logs, and even bringing down a message board are just some of the things you’ll learn to do. And that’s an important point there: Hacknet is very much an authentic hacking simulator from the very moment you boot it up, create a user name (under which you conduct your business dealings), pick a password (gotta protect your profile!) 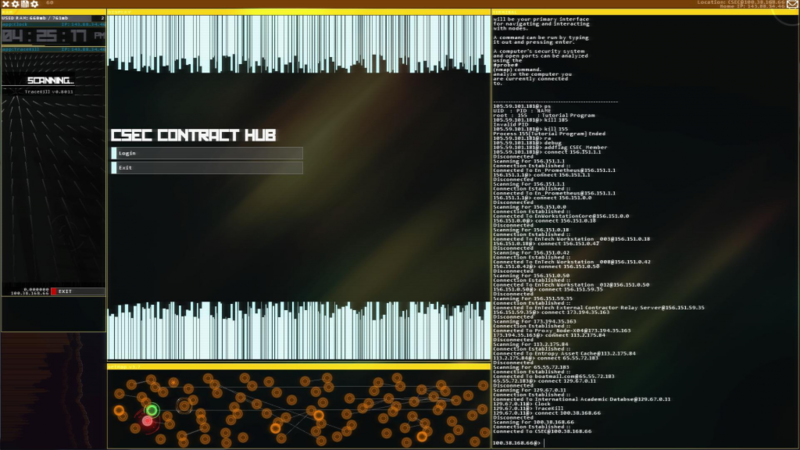 and see walls of console commands scroll down your screen as your in-game machine whirs to life. Violence in games is overrated, let’s teach kids to hijack government websites. If you’re anything like me, you dream that a studio will one day bring out a fantastic Matrix game (my money was on Rocksteady, up until a few months ago...) and finally fill that notable green and black abyss in what is already a re-invigorated and solidified cyberpunk game scene. Well, if you enjoyed the little hacking mini-game in 2003’s Enter The Matrix, arguably the finest Matrix game we’ve ever had, or will ever have (which isn’t saying much, unfortunately), Hacknet will more than give you your fill. For my eleven year-old self, that Matrix mini-game was the closest thing I ever thought I’d get to being a digital Robin Hood/badass master hacker. Sure, games such as Bioshock – with its unique pipe system – and Fallout 3 – with its fun yet simplistic ‘pick-the-password’ system – introduced me to hacking in video games on the PS3 but not even those critically acclaimed titles really captured the essence of rooting around the innards of a computer and getting your grubby mitts on info you had no way of knowing (of course, hacking wasn’t a super massive mechanic in those games) but still, I pined for the MS-DOS-reminiscent days of Enter The Matrix‘s system. That was until I stumbled upon Uplink on Steam. A very good game in its own right, I see Uplink as a prototypical Hacknet, and I’m sure Hacknet is very much a love letter to 2001’s code-crunching title. From the moment I started playing, Hacknet hit me as a slightly easier and more user-friendly Uplink HD: the menus were somewhat stylised but still incredibly authentic; the steep learning curve (though there is an excellent, unobtrusive tutorial that acts as Hacknet‘s narrative opening); and its purposefully complex design and challenging nature (at least to the uninitiated) makes those successful online textual skirmishes all the more rewarding. Just like Uplink, I found myself being drawn deeper and deeper into Hacknet – though simple when compared to the flashbangery of modern AAA titles, it’s incredibly immersive and addictive. However, for all its similarities, there are significant differences between the two: notably, where Uplink threw you deep into the sandbox with no real overarching objectives or story (which is liberating), Hacknet gives you some plot and a whole lotta reasons to figure it out (which ultimately keeps me coming back). While it ditches the RPG-lite features of Uplink, which had you earn money through successfully completed contracts to pay off fines for botching other hacking jobs, or else upgrading your rig to take on bigger and more powerful systems for larger bankrolls, Hacknet brings in a delicately weaved story – a wispy narrative arc, really – that never detracts from the game’s core mechanic: that is, to hack – to get in, get what you need, and get out with no-one knowing you were there. You are, however, given access to more tools and exe’s as you complete jobs, so the progression in difficulty is a genuinely natural one. We’ve had issues with both in the past. A visually impressive, authentic hacking simulator, just like its subject matter, there is certainly more to Hacknet than meets the eye. It’s tense, surprisingly funny, and definitely worth your time – especially if you like digging around your games to find their buried treasure. Take the red pill, stick with it and you’ll be rewarded with a memorable gaming experience. Take the blue pill and you’ll be missing out. You can hack into LoadScreen on Twitter @load_screen and Facebook.